Following the tremendous success of the 88 Qing Beeng (88 Raw Cake), it had been Master Chan’s aspiration to create another tea cake to be a worthy successor. Utilizing his years of experience and expertise, Master Chan created the Treasures from Five Mountains, blending high quality leaves from five mountains in Lincang according to each tea’s strength, mouth feel, body, sweetness, aftertaste and how each tea complement each other. The harmonious blend has resulted in a rich and complex brew with layers of distinct flavors and characters. Since the debut of the 2008 Edition, this cake has been sought after by tea connoisseurs in China and Hong Kong. 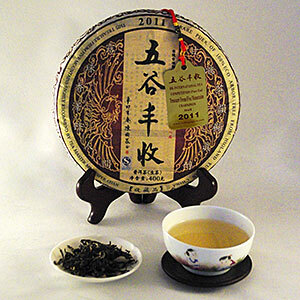 This tea has distinguished itself by winning the Champion Award in the Aged Tea Category (Pu-erh) of the International Tea Competition 2011 at the Hong Kong Tea Festival. This tea is crisp, full-bodied and offers a long lasting after-taste that lingers in your mouth. The blend presents an array of flavors that morph from brew to brew, switching from honey, plum, longan and lotus. In time, this cake may reach, if not surpass, the same success as its predecessor 88 Qing Beeng. Hence, it is a great choice for collectors. Client Christina K. was inspired by this tea to write a poem. Below is an excerpt; the full poem can be seen through the link at the end. 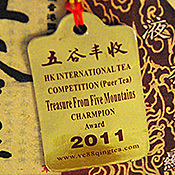 Just received a sample of a 2011 Treasure from Five Mountains Sheng Pu-erh. This tea is so elegant so refined, and with each cup there is a bouquet of flavors. Honey, lotus, I even taste tangerine. This is an amazing tea.